Anyone have experience with this fly rod? I'm looking to get my buddy into fly fishing and found this deal online. Or any recommendations for a nice combo in the $150 range? He will be using it more for bass and pike. I have the 8'-6" 4-wt and my brother has the 9' 5-wt. I don't have a lot of experience with other rods but I really like it. 8 ft 7wgt Eagle Claw Featherlight for maybe $35.00 and a click and pawl reel from Ebay for less than $50.00. I have the 8'6" 4wt as well and love it. Don't have much experience with other combos but would definitely suggest it. For the money, you can't get a better value on rod, reel, line, backing and case. I got my 8wt combo for the same reason, good value for the price. I have fished pike and bass and it has worked great. 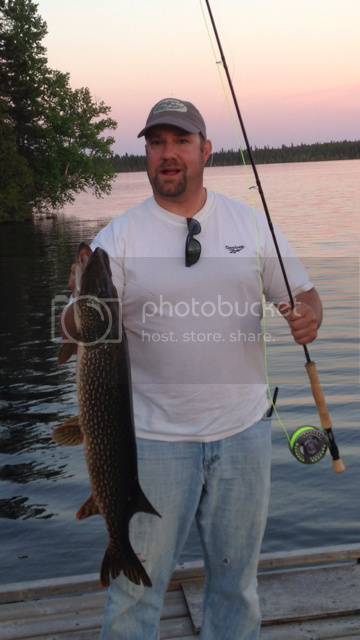 The 35" pike below tested the drag a bit, and the reel performed well. If you can find one for $150, let me know, I am all over it!